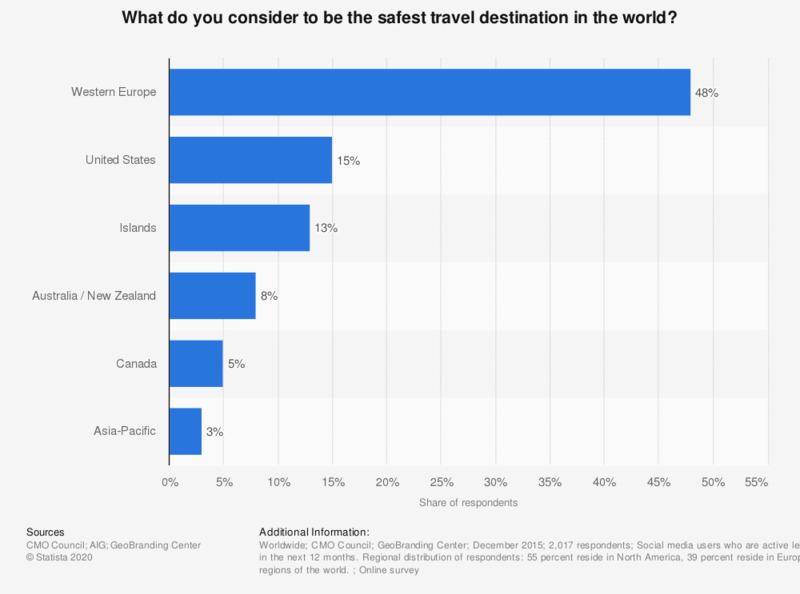 What do you consider to be the safest travel destination in the world? This statistic shows the safest destinations worldwidein 2015. During the survey, 15 percent of respondents said they thought the United States was the safest travel destination in the world. Social media users who are active leisure travelers and plan to travel in the next 12 months. Regional distribution of respondents: 55 percent reside in North America, 39 percent reside in Europe and 5 percent reside in other regions of the world. The source does not provide detailed information regarding the questions. The chosen wording here might therefore differ slightly from the survey. The source did not provide the date of survey. The date provided is the date of publication. The source did not provide the age of the survey respondents. Which countries have you visited in the last 12 months?